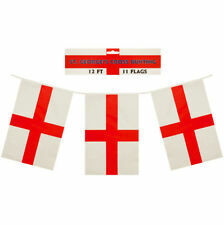 15M England St George Rectangular 8 Flag Bunting Garland for National Celebrations TRIXES. ENGLAND BUNTING GARLAND - Rectangular 8 flag garland string featuring the English patriotic colours red and white. 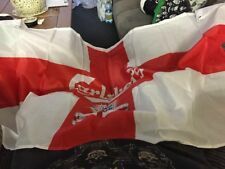 • 5x3 ft England flag, 2 x 10m St George bunting & 50 x flag picks. • High quality plastic bunting (Approx. 10m length, 20 flags, flag size: 30cm x 20cm). The bunting has a number of individual plastic pennant flags which will flutter in the breeze and truly add to the sense of occasion. ST GEORGE'S PENNANT BUNTING - 25FT LONG! Total of 12 flags on one bunting. 3 LIONS ENGLAND DESIGN BANNER. 4 BRASS EYELETS FOR EASY HANGING 1 IN EACH CORNER. 100% POLYESTER FLAG MATERIAL. WILL BRIGHTEN UP & TRANSFORM ANY WALL SPACE. DOUBLE STITCHED. RUGBY 6 NATIONS BUNTING. WALES -FRANCE - ITALY. ENGLAND -IRELAND -SCOTLAND. English (St.George) 7m flag bunting. Measures approximately 7m (22') x 0.3m (11.5"). Consists of 20 flags, each measuring approximately 0.3m x 0.18cm. FABRIC BUNTING. 28 X 9" X 6" FLAGS. Heavy duty pvc bunting but lightweight so that it flutters in the wind. Strong pvc material. I will fold and put under a heavy object to flatten. England Fabric Bunting. All made in England to fantastic quantity. Poly cotton single sided flags with cotton hanger. FABRIC TRIANGLE BUNTING. 20 X 12" X 9" FLAGS. St George's Flag PVC Bunting. FANCY DRESS. Your statutory rights are not affected by this Policy. 5.4m x 35cm. Rugby and cricket events. 2 x England car flags. England St George Bunting. Your statutory rights are not affected by this Policy. FANCY DRESS. RRP £ 0.00. Sending an item back to us. Indoor use. FUND RAISING.